Mary T. Meagher Plant, Amy Van Dyken and the 1976 women’s 4×100 freestyle relay team have all been selected as finalists for the 2008 U.S. Olympic Hall of Fame. The United States Olympic Committee invites the public to vote online at usolympichalloffame.com to help determine who will comprise the next class of inductees. Six individual Olympians, one Olympic team and one Paralympian, along with a coach, a veteran and a special contributor, will be honored during the U.S. Olympic Hall of Fame induction ceremony, June 19 in Chicago. Envisioned as a lasting tribute to the pursuit of excellence and the Olympic ideals, the U.S. Olympic Hall of Fame was established to celebrate the achievements of America’s premier athletes in the modern Olympic Games. The Class of 2008 finalists in the individual sport/event, team and Paralympic categories were selected by a nominating committee consisting of athletes, members of the U.S. Olympic Hall of Fame, historians and USOC representatives. Public voting at usolympichalloffame.com continues through Friday, March 28. Mary T. Meagher Plant – Mary T. Meagher Plant started her swimming career at the age of 14 by setting a world record at the 1979 Pan American Games. Meagher Plant was expected to compete with the U.S. National Team at the 1980 Olympic Games, but the U.S. boycott prevented that debut. The following year at the 1981 U.S. National Championships, Meagher Plant produced an outstanding performance and set world records in both the 200m and 100m butterfly. Those records stood almost two decades. Meagher Plant, appropriately nicknamed Madame Butterfly, was named Female World Swimmer twice by Swimming World Magazine. She was also named as Sports Illustrated’s 100 Greatest Women Athletes. At the 1984 Olympic Games, Meagher-Plant brought home gold medals in the 200m, 100m, and medley relay. In 1988 at the Olympic Games in Seoul, she brought home a bronze medal in the 200m butterfly. At the end of her competitive career, Meagher Plant held 24 U.S. National titles. Amy Van Dyken – In addition to her impressive performance at the Olympic Games where she brought home four gold medals from Atlanta in 1996 and two gold medals from Sydney in 2000, Amy Van Dyken has won four World Championship titles and three gold medals at the Pan American Games in 1995. 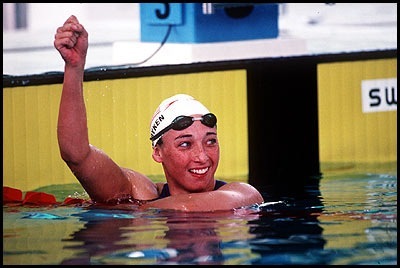 Van Dyken earned an ESPY Award for Female Athlete of the Year and Swimming World magazine’s female Swimmer of the Year award. She was inducted into the Colorado Sports Hall of Fame and was also named Associated Press Female Athlete of the Year. She became the USOC Sportswoman of the Year, the Women’s Sports Foundation Sportswoman of the Year and USA Swimming Swimmer of the Year, all in 1996. On May 12, she was inducted into the International Swimming Hall of Fame’s Class of 2007. 1976 Women’s 4×100 Free Relay – The 1976 Women’s Swimming 4x100m Freestyle Relay Team consisted of Kim Peyton, Jill Sterkel, Shirley Babashoff, and Wendy Boglioli. They captured gold at The Games in Montreal and set a new world record. In the first 12 Women’s Swimming events at the Montreal Olympic Games, the East Germans had won 11 gold medals and the Soviet Union had won one. The record stood for two years until another United States swim team would break it. Peyton was a backup swimmer at the 1972 Games and competed with the team at the 1976 Games. Jill Sterkel won gold with the team in 1976 and went on to win a second gold in 1984 in the same event. In 1988, Sterkel earned a bronze in the Freestyle Relay and the 50m Freestyle. She also clinched a 1978 World Championship title. Shirley Babashoff captured two gold and six silver medals in her Paralympic competitions. She also won two World Championship titles, five silver, and one bronze. In 2005, she received the Olympic Order. Wendy Boglioli won one team gold and one individual bronze at the 1976 Olympic Games.